After the success of his first season and his recent stint in The Defenders late last year, Luke Cage (Mike Coulter) returns to protect the people of Harlem caught in the middle of an explosive gang war between the nefarious Mariah Dillard (Alfre Woodard) and the new kid on the block, Bushmaster (Mustafa Shakir). Luke Cage‘s second season may not be as powerful as its first which was graced by the presence of Mahershala Ali‘s villain Cottonmouth, but it is still a strong season making the most of great character development arcs and a story that takes twists and turns where you least expect it. The season kicks off strong, reintroducing us to Cage and the current state of Harlem before it begins to drop off and meander through the first half-dozen episodes or so. There are still a number of entertaining components of these episodes such as how they delve inside the warring criminal organisations, but despite the positive elements here the story doesn’t feel like it’s moving or building towards anything at a quick enough pace. Leading into the latter half of the season though it starts to really intensify and this is where character arcs clash and some of the earlier setup begins to pay off. This unevenness in the season is something that has plagued the various Marvel Netflix shows on a number of occasions and I believe rather than the seemingly default 13 episodes, they should aim for a slightly more concise 10 episode run. As oppose to stretching out plot points to hit that 13th episode it’d better if they just let storylines play out naturally and if it ends up being 10 or even 9 episodes then so be it. The roster of new and returning characters is absolutely the highlight of the season as there are some incredible supporting performances behind some crucial individual character arcs. Mike Coulter is great as ever as the people of Harlem’s human shield and his charismatic and emotional performance headlines the show really well. He’s a fantastic protagonist and where you journey through the season predominantly from his perspective, his outlook isn’t perfect, this allows room for you to question his judgement and adds further depth to our hero. But as great as this ‘Hero for Hire’ is, he is at times overshadowed by some of the fantastically written supporting characters and the performances behind them. Misty Knight (Simone Missick) has a more involved role this season and a much more intriguing story especially coming off of her presence in The Defenders. She acts as nice contrast to Luke Cage as she provides a different angle to fighting crime, one that’s more in line with the law but still not necessarily lawful. The late Reg E. Cathey plays Cage’s father James Lucas in his final role and he has a major crucial role to play in Cage’s emotional journey through the season. He really is an acting force and has a number of fantastic emotional moments throughout, making quite an impact on the season as a whole. His presence is one of the most meaningful in here and he is an acting talent who will be missed. The standout for me this season is undoubtedly Theo Rossi‘s Shades who has a larger presence this season and a more involved villainous role alongside Mariah Dillard. I found his overall arc the most engaging throughout the entire season as there are so many curveballs thrown that it makes his journey unpredictable and fun to follow. There’s so much depth and conflict to the character this time around and Theo Rossi does an incredible job at bringing personality and intrigue to Shades. Speaking of villains there is a heavy focus on the two major players Mariah Dillard and Bushmaster as it’s their gang warfare which attracts Luke Cage to intervene. I love the way the inner workings and behind the scenes of these two sides are explored throughout the season so that you go into each moment later on with an understanding of both sides of the coin. As far as female powerhouses go, Mariah Dillard establishes herself as a force to be reckoned with here and has quite an intriguing story to tell. Bushmaster is bought into this season with a powerful introduction and has an important role to play in the larger story going on. There were moments where his story wasn’t as intriguing as I wanted it to be but for the most part he’s good as the main force in the way of Luke Cage. The show does well in spending some time to flesh out its villains’ motivations and focus on some key emotional moments. With Bushmaster that’s executed through some flashbacks to his childhood and with Mariah it’s explored through the presence of her daughter Tilda Johnson (Gabrielle Dennis). Humour is handled in a way that doesn’t give the season an overly campy tone and is nicely integrated. It takes a subtle approach and delivers comedy through clever one-liners, most of which are delivered by Luke Cage himself with some supporting characters getting one in here and there. Iron Fist (Finn Jones) gets his fair share of comedic moments when he returns to team up with Cage in season 2, his exact involvement in the story I won’t spoil but he breaths some life into the season and is absolutely one of the highlights. The chemistry he has with Luke is electric so if a ‘Heroes for Hire’ series is ever on the cards it would be a must watch for me. The connective tissue to the wider Netflix universe is handled very well in this show and it stands on its own whilst also making sense within the universe it resides. The soundtrack of season 1 was one of the strong points and that’s no different with season 2. The variety of hip-hop music that outlines each episode is a fantastic accompaniment to the story and is very representative of the neighbourhood and history of Harlem. The featuring of artists performing the music live within the episodes is a nice touch similar to how Twin Peaks: The Return approached incorporating music artists in the show. 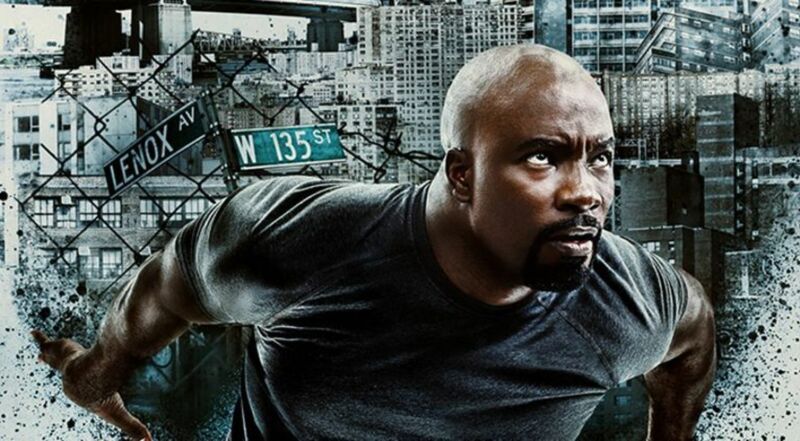 So, in the end Luke Cage season 2 is another strong entry to the Marvel Netflix Universe of shows which mainly suffers from common issues shared by a few of those other Marvel series’. The pacing is a little off more-so in the first half and a bit jittery but it rectifies that as it progresses towards the climax. There are a couple of subplots here and there that deviate from the core story and aren’t entirely as engaging but they’re very minor. The grounded hand-to-hand combat is awesome when it’s there but the show is a little lighter on the action this time around which isn’t necessarily bad just something I observed. Great character arcs, strong villains, and a largely unpredictable story make this season of Luke Cage a worthwhile watch.